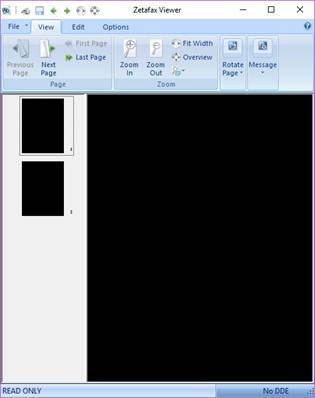 When using Zetafax with an application using the Zetafax Automation Toolkit for submitting faxes, manually resending a failed fax using the Zetafax Client results in entirely black pages being sent. This affects every page of the fax (except the fax coversheet page if added), as shown in the following typical screenshot. The issue only occurs when resending a fax which was originally submitted by the application, on systems with the Document Rendering add-on. Zetafax uses two different mechanisms for converting graphics files into the correct format for sending: the DOCTIFF document rendering engine, and a graphics library. DOCTIFF supports a wide range of graphics and document file formats, but is only enabled for graphics file conversion on systems with the Document Rendering add-on installed. When a fax is submitted using the Zetafax Automation Toolkit, the Zetafax Server converts the image file if necessary, using DOCTIFF if the Document Rendering add-on is licenced, or the graphics library otherwise. On Zetafax version 17.0 and older Zetafax systems, if that fax is subsequently resent using the Zetafax Client, the client will convert the image file again if necessary using the graphics library. If the image file which is supplied is not compatible with the graphics library, then in some cases the file conversion will appear to succeed but the resulting image will be solid black. This behaviour has been seen with TIFF files using LZW format and advanced compression options (horizontal differencing), but may affect other file formats as well. An update for the Zetafax Client is available which corrects this issue. It changes the behaviour of the client when resending a fax from the OUT window so that it copies the original message file(s) without performing any additional conversion process. This issue is due to the behaviour of the Zetafax Client application when forwarding or resending faxes which have been submitted with the Zetafax Automation Toolkit using an unsupported file format. The issue has been corrected with the update detailed above, and this will be included in the next full version release of Zetafax.